Removing sticky residue from various surfaces can be a challenge. Things like packing tape, stickers from price tags, advertisement labels, packing glue, masking tape, and more can leave a nasty sticky substance behind. It can be a gooey residue blob of mess that is not easy to remove. Here’s a list of 20 items that can help make the cleanup of sticky adhesives easier. These methods or adhesive removal products can remove things like crayons, tar, grease and gum. You may need to experiment with some of these to find the correct one to remove the adhesive. Once the gooey mess has been removed, wash the surface with soap and water to remove any leftover gunk. If one removal method does not work for you, then wash off the remainder of the method you tried and try another. Try to use the least harmful product first and work your way to chemical solvents when all else fails. We had a sticky mess from a ROSS label on a beautiful picture frame. We did not want to use harsh chemicals as it might have damaged it. We tried soap and hand lotion and it did not fully remove it. But guess what? Peanut butter completely got all the residue off without any damage! We left it sit for about 15 minutes then wiped it off. It worked awesome! We also had a new wood table we bought at IKEA that had streaks from a tacky substance from the way it was packed. We tried peanut butter and it worked well and the oil in the peanut butter polished at the same time. Peanut butter is amazing! NOTE: Do not use nail polish remover on plastic as it will eat through it. 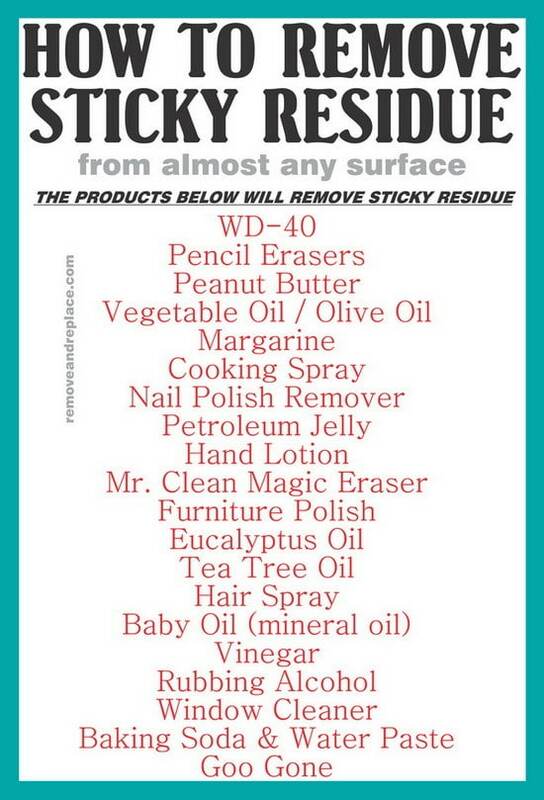 If you know of some better ways to remove sticky residue from any surface, please let us know by leaving a comment below. I’m not sure how the heck to get the residue off my blinds which are brown. what would you suggest out of the list…. Peanut butter worked great for getting chewing gum off my bicycle tire. I had heard that nail polish remover and Goo Gone would crack the tire, so I didn’t want to use that.